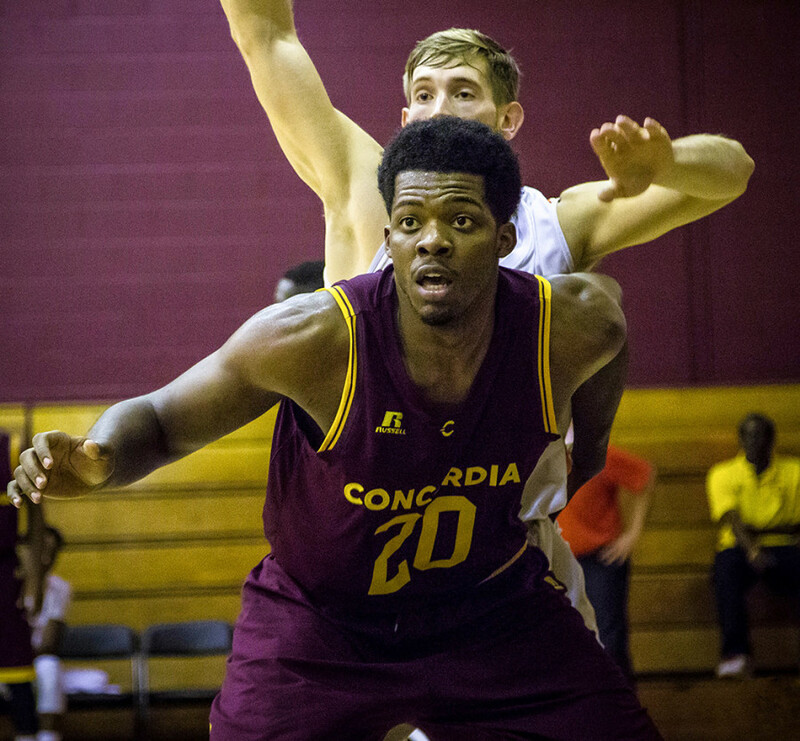 Basketball players like Malcolm Henderson are hard to find in Canadian Interuniversity Sport. He’s big and he’s strong, but most importantly he has competed at the biggest collegiate stage possible. The Montrealer spent the past two years practicing and playing for the California State University Fullerton Titans in the NCAA Division One. “It’s not easy to find six-foot-eight guys with experience that played in the NCAA, and at [centre],” said Stingers head coach Rastko Popovic. Henderson’s experience and maturity might be his greatest gifts to a junior Stingers squad. The incoming class is very good, Popovic says, but also very young. After winning the 2011 national championship with the Vanier College Cheetahs alongside current Stingers teammate Michael Fosu in CEGEP, Henderson headed south. In the U.S., he first played for the Missouri–West Plains Grizzlies in the National Junior College Athletic Association. JUCO is an athletic association made up of two-year community colleges and junior colleges, whereas the better-known NCAA takes from major and state-run universities. The road ahead wouldn’t be easy. Only 28 former JUCO players play or have played in the NBA, according to jucorecruiting.com. The majority of professional players in the NBA today have played in the NCAA but that’s what Henderson was aiming for. His aim was thrown off one year later. With only a week left before opening tipoff with the Grizzlies, Henderson tore his anterior cruciate ligament, in his knee. Unlike most people who’ve injured their ACL, Henderson did not feel pain right away, and consequently didn’t learn of his injury immediately after it happened. That’s dangerous, because the injury can be exacerbated before it’s treated. Luckily for him, he says, he already had some exposure before the injury. At an annual junior college jamboree in early October, before his injury—a small tournament with no actual champions—Fullerton coaches spotted Henderson. “I still had a future, so it wasn’t like I tore my ACL and I was done,” said Henderson. “I’m still going to be fine, [I’m] still going to be taken care of,” he told himself. CSUF head coach Dedrique Taylor was there. 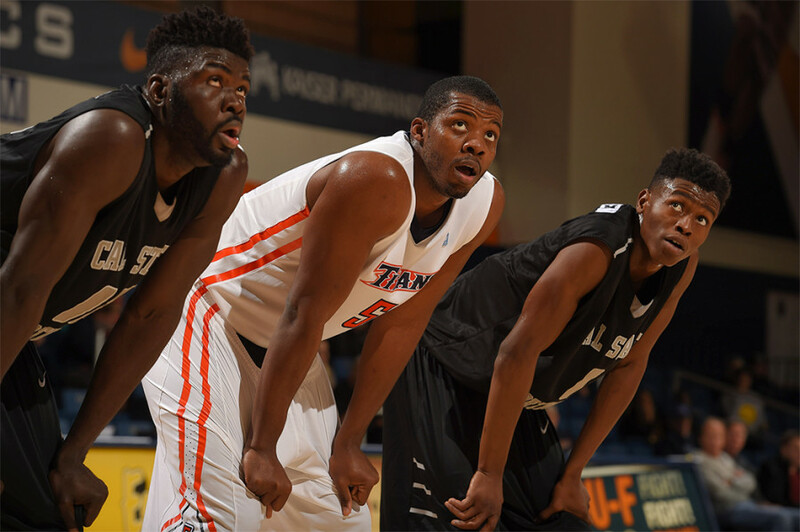 CSUF was looking for a “big guy” and Henderson stood out to them. He joined the Fullerton Titans in 2014, two years after he joined the Grizzlies. When Taylor speaks of his former player, it’s easier to understand why Henderson is important to the Stingers roster. Henderson is mature, and when he spoke—which was not often—his teammates listened. After sitting out a year in JUCO due to his knee injury, Henderson was forced to miss a second consecutive year because of NCAA eligibility. He is still not 100 per cent sure of the reason. This meant that he could participate in practices but not play games. Another example of Henderson’s maturity lies in his approach to playing Division One in the first place. It’s what he envisioned when he was shooting balls in the Vanier gym and the hype of NCAA basketball didn’t bother him. His playing career under the California sun was brief, just a year, and after graduating with a diploma in Kinesiology, Henderson was looking to come back to his homeland to get a Masters and to keep playing. Henderson understands the game, something he’s learned mostly from Taylor, he says. Plus, now that his knee is fully recovered, he’s thankful there weren’t any complications. Henderson says that things would have been different if he hadn’t injured his knee, but he still achieved his goal of playing Division One. “Being an older guy, being a guy that did Division One, [and] did the Nationals in CEGEP, I can help these guys,” he said.